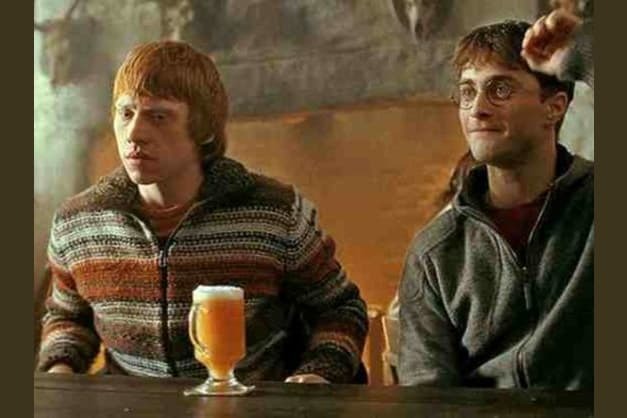 Which Harry Potter Drink Was Named After You? Would you rather... have detention with Umbridge or Occlumency lessons with Snape? Would you rather fly by broom or travel by floo powder? Would it be more useful for you to have a Time Turner or a Remembrall? Would you rather only eat chocolate frogs for every meal (and have to catch them), or never eat chocolate again? Would you rather spend Christmas at Hogwarts or Christmas at the Burrow/Grimmauld Place? Would you rather be an accomplished Legilimens (able to read other's thoughts), or an accomplished Occlumist (able to prevent others from reading your own thoughts)? Would you rather tickle a sleeping dragon or skinny dip with the Giant Squid (and friends)? Would you rather be an Animagus or a Metamorphmagus? You're a butterbeer! You're rarely in the mood for something, and you'd much rather have a good time with your best friends. You're always down to go out and party, though, and people would describe you as warm, inviting, and totally approachable! What Harry Potter drink have you tried IRL? Which "Would You Rather" was the hardest? Tell us about it in the comments below, and don't forget to share this quiz with a fellow Potterhead! Passionate and fiery, you're Firewhiskey! You can be a little unpredictable, but at your core, you're definitely driven by your wild sense of adventure. You're always looking for a new experience, and you're always up for a challenge. Sweet and laid back, you're pumpkin juice! You're not much of a party-er, but you love spending time with friends in calmer settings. You can need a lot of personal time to yourself, but people adore your warmth and cheerfulness! Sophisticated and practical, you're Dragon Barrel Brandy! You don't party hard, but you're definitely social when you want to be. You like spending time out with friends, but you'll need some space to curl up next to the fire with a good book and a bottle of brandy! Which of the magical drinks brewed in Harry Potter totally matches your personality? Answer these wizarding "Would You Rather"s, and we'll tell you!